مهدویان فرد, فرزاد, رحیمی, حبیب. (1395). برش نگاری دوبعدی موج ریلی برای پوسته و گوشته بالایی کپه داغ. مجله ژئوفیزیک ایران, 10(2), 25-38. فرزاد مهدویان فرد; حبیب رحیمی. "برش نگاری دوبعدی موج ریلی برای پوسته و گوشته بالایی کپه داغ". 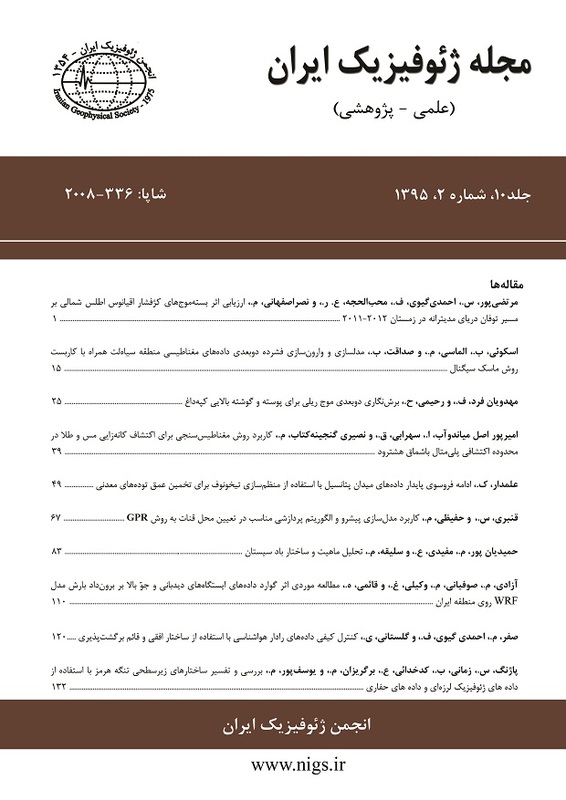 مجله ژئوفیزیک ایران, 10, 2, 1395, 25-38. مهدویان فرد, فرزاد, رحیمی, حبیب. (1395). 'برش نگاری دوبعدی موج ریلی برای پوسته و گوشته بالایی کپه داغ', مجله ژئوفیزیک ایران, 10(2), pp. 25-38. مهدویان فرد, فرزاد, رحیمی, حبیب. برش نگاری دوبعدی موج ریلی برای پوسته و گوشته بالایی کپه داغ. مجله ژئوفیزیک ایران, 1395; 10(2): 25-38. در این مطالعه نقشه‌های برش‌نگاری (توموگرافی) دوبعدی سرعت گروه با استفاده از پردازش تک‌ایستگاهی برآورد شده است. داده‌های زمین‌لرزه‌های محلی مربوط به بازه زمانی 2006 تا 2013 ثبت‌شده در 6 ایستگاه سه‌مولفه‌ای نوارپهن شبکه‌های لرزه‌نگاری پژوهشگاه بین‌المللی زلزله شناسی و مهندسی زلزله تحلیل شد. عمده کار در این مطالعه، دستیابی به نتایج برش‌نگاری با استفاده از روش تک‌ایستگاهی است. برای این منظور، ابتدا بر روی داده‌ها تصحیحات اولیه صورت گرفته و مدهای اساسی موج سطحی برای 1075 زمین‌لرزه با استفاده از این روش با تحلیل زمان- بسامد از لرزه‌نگاشت‌ها جدا شدند. مدهای اساسی موج سطحی جداشده به‌وسیله نرم‌افزار FTAN و منحنی‌های پاشش سرعت‌های گروه به‌دست‌آمده توسط آن با استفاده از کد نوشته‌شده و روش وارون‌سازی خطی یانوسکایا-دیتمار برای برآورد نقشه‌های برش‌نگاری دوبعدی سرعت گروه استفاده شدند. با توجه به نتایج به‌دست‌آمده از برش‌نگاری دوبعدی در دوره‌های تناوب پایین 3 و 5 ثانیه (اعماق کم)، یک بی‌هنجاری سرعت بالا در قسمت جنوبی ناحیه کپه‌داغ مشاهده می‌شود که به‌صورت کاملاً واضح ناحیه رسوبی البرز-بینالود را از ناحیه کپه‌داغ جدا کرده است؛ بنابراین می‌توان یک جدایش مرزی را بین ناحیه البرز-بینالود و ناحیه کپه‌داغ قائل شد. در دوره تناوب 20 ثانیه، یک بی‌هنجاری سرعت بالا از شمال تا جنوب منطقه کشیده شده است. در غرب این بی‌هنجاری پرسرعت نیز یک بی‌هنجاری کم‌سرعت وجود دارد که مرز واضحی را ایجاد کرده است. در دوره تناوب 35 ثانیه مدل برش‌نگاری به‌دست آمده وجود یک بی‌هنجاری پرسرعت و کم‌سرعت را در فواصل نزدیک به گوشته بالایی آشکار می‌کند که با مرز واضحی از یکدیگر جدا شده‌اند. In this study, using single-station dispersion curves, two-dimensional tomographic maps of group velocity have been estimated for Kopeh Dagh region in the northeast of Iran. An investigation of the structure of the lithosphere and the asthenosphere of the Kopeh Dagh region is of great interest because of the complex tectonics of this area. The Kopeh Dagh forms an NW–SE range of mountains separating the Turkmen (Turan) shield from central Iran. The belt is up to 3000 m in elevation, rising 2000 m above the Turkmen plains. It is highest and narrowest in its center and the east, becoming broader and lower towards the west, where it merges with the lowlands of the SE Caspian shore. The range is asymmetric, with a steep, linear and narrow NE side on which short, straight streams run directly from the high ground to the Turkmen plain. Its SW flank contains gentler slopes, is less regular, and contains a broader, more developed drainage network. The NE flank of the Kopeh Dagh is assumed to be underlain by ‘Hercynian’ basement of the Turan shield, while the range itself contains thick Jurassic–Cretaceous marine sediments overlain by Eocene marls with some andesitic volcanoclastic horizons. These, in turn, are overlain by thick marine Pliocene units in the west (which continue into the South Caspian Basin) merging eastward into a continental sequence of equivalent age, reflecting the diachronous emergence of the range. Although there is some evidence for local structural detachments in Jurassic evaporites, most of the late Cenozoic and active folds in the Kopeh Dagh are thought to have developed in the hanging-walls of basement-cored thrusts. There is no evidence for major salt thicknesses that can produce large-scale regional decollement levels, as in the Zagros. Earthquakes in the Kopeh Dagh involve mostly right-lateral strike-slip faulting trending N to NNW or reverse faulting parallel to the NW regional strike. The abrupt linear topographic front forming the NE margin of the Kopeh Dagh follows a fault zone referred to as the Main Kopeh Dagh or Ashkabad Fault. The analysis of the lateral variations in group velocities in low, intermediate and long period is an optimal tool for the identification of the main different tectonic features present in the complex Kopeh Dagh region. These parameters are sampling crust and upper mantle structures as period increases from 3 s to 35 s. Generally, shorter periods bring information about velocity properties at shallow depths, whereas longer periods sample deeper into the Earth’s upper mantle. To explore two-dimensional tomographic maps, in the time period of 2006 to 2013, local earthquakes with high signal-to-noise ratio recorded in six broad-band stations operated by International Institute of Earthquake Engineering and Seismology (IIEES) are selected. In the first step, initial corrections were performed and surface wave fundamental modes for 1075 earthquakes are isolated. Frequency- time analysis software (FTAN) is used to isolate fundamental mode from higher modes. By using this approach, single-station dispersion curves are calculated. The estimated group velocity dispersion curves are used to explore two-dimensional tomographic maps. Yanovskaya–Ditmar linear inversion method was used to achieve this goal. According to the obtained two-dimensional tomography maps, in low periods of 3 s and 5 s (shallow depth), we find a high-velocity anomaly in the south of Kopeh Dagh region that has sharply separated Alborz–Binalud zone from the Kopeh Dagh zone; so we can consider a separation boundary between Alborz–Binalud zone and Kopeh Dagh zone. In the period of 20 s, we have a high-velocity anomaly from north to south. At the west of this high-velocity anomaly, also there is a low velocity that makes a sharp boundary. In the period of 35 s, the tomographic model obtained reveals high- and low-velocity anomalies in the near distances of the uppermost mantle which have been separated from each other with a sharp boundary. آقانباتی، س. ع.، 1383، زمین‌شناسی ایران: سازمان زمین‌شناسی و اکتشافات معدن کشور. افشار حرب، ع.، 1380، زمین‌شناسی نفت ایران: جزوه آموزشی، پردیس دانشکده‌های فنی، دانشگاه تهران. Alavi, M., 1992, Thrust tectonics of the Binalood region, NE Iran: Tectonics, 11, 37–360. Backus, G. E., and Gilbert, F., 1968, The resolving power of gross earth data: Geophys. J. Int., 16, 169–205. Chen, Y., Badal, J., and Hu., J., 2010, Love and Rayleigh wave tomography of the Qinghai-Tibet plateau and surrounding areas: Geophys. J. Int., 167(10), 1171–1203. Crosson, S., 2007, Checkerboard Test for 3-D Tomography Model of Washington Cascadia Margin: Earth and Space Sciences, University of Washington, Seattle, Washington. Ditmar, P. G., and Yanovskaya, T. B., 1987, Generalization of Backus–Gilbert method for estimation of lateral variations of surface wave velocities: Phys. Solid Earth, Izvestia Acad. Sci. USSR, 23 (6), 470–477. Dziewonski, A., S. Bloch, and Landisman, M., 1969, A technique for the analysis of transient seismic signals: Bull. Seism. Soc. Am. 59, 427–444. Hollingsworth, J., Fattahi, M., Walker, R., Talebian, M., Bahroudi, A., Bolourchi, M., Jackson, J., and Copley, A., 2010, Oroclinal bending, distributed thrust and strike-slip faulting, and the accommodation of Arabia–Eurasia convergence in NE Iran since the Oligocene: Geophys. J. Int. 181, 1214–1246. Hollingsworth, J., Jackson, J., Walker, R., Gheitanchi, M., and Bolourchi, M., 2006, Strike-slip faulting, rotation, and along-strike elongation in the Kopeh Dagh mountains, NE Iran: Geophys. J. Int., 166, 1161–1177. Jackson, J. A., and McKenzi, D. P., 1984, Active tectonics of the Alpine–Himalayan belt between Western Turkey and Pakistan: Geophys. J. Royal Astronomical Soc., 77, 185–264. Landisman, M., Dziewonski, A., and Sato, Y., 1969, Recent improvements in the analysis of surface observations: Geophys. J. Int., 17, 369–403. Lévěque, J. J., Rivera, L., and Wittlinger, G., 1993, On the use of the checkerboard test to assess the resolution of tomographic inversions: Geophys. J. Int., 115, 313–318. Levshin, A. L., Ritzwoller, M. H., and Resovsky, J. S., 1999, Source effects on surface wave group travel times and group velocity maps: Phys. Earth Planet Inter., 115, 293–312. McKenzie, D., 1972, Active tectonics of the Mediterranean region: Geophys. J. Roy. Astr. Soc., 30, 109–185. Motaghi, K., Tatar, M., Priestley, K., Romanelli, F., Doglioni, C., and Panza, G. F., 2014, The deep structure of the Iranian Plateau: Gondwana Research, 1–12. Motaghi, k., Tatar, M., Shomali, Z. H., Kaviani, A., and Priestley, K., 2012, High resolution image of uppermost mantle beneath NE Iran continental collision zone: Physics of the Earth and Planetary Interiors, 208–209, 38–49. Panza, G. F., 1976, Phase velocity determination of fundamental Love and Rayleigh waves: Pure Appl. Geophys., 114, pp. 753–764. Rahimi, H., Hamzehloo, H., Vaccari, F., and Panza, G. F., 2014, Shear-wave velocity tomography of the lithosphere–asthenosphere system beneath the Iranian Plateau: Bull. Seism. Soc. of Am., 104)6(, 2782-2798. Tchalenko, J. S., and Berberian, M., 1975, Dasht-e-Bayaz fault, Iran: Earthquake and earlier related structures in bedrock: Geol. Surv. Am. Bull., 86, 703–709. Woodhouse, J. H., and Dziewonski, A. M. 1984, Mapping the upper mantle: Three-dimensional modeling of earth structure by inversion of seismic waveforms: J. Geophys. Res., 89, 5953–5986. Xuemei, Z., 2009, The structural model of the lithosphere–asthenosphere system in the Qinghai-Tibet and its adjacent areas from surface wave tomography: Chinese Academy of Science, Institute of Geology and Geophysics. Yanovskaya, T. B. and Ditmar, P. G., 1990, Smoothness criteria in surface wave tomography: Geophys. J. Int., 102, 63–72. Yanovskaya T. B., 1987, Resolution estimation in the problem of seismic ray tomography: Izv Phys Solid Earth, 33 (9), 762–765.